For a vehicle that has been issued with a pink or green sticker (other than a ‘G2’ green sticker) or that has its WoF revoked: the date the vehicle passes the inspection. Important note: A vehicle’s date of first registration anywhere is generally not available to the WoF inspector. 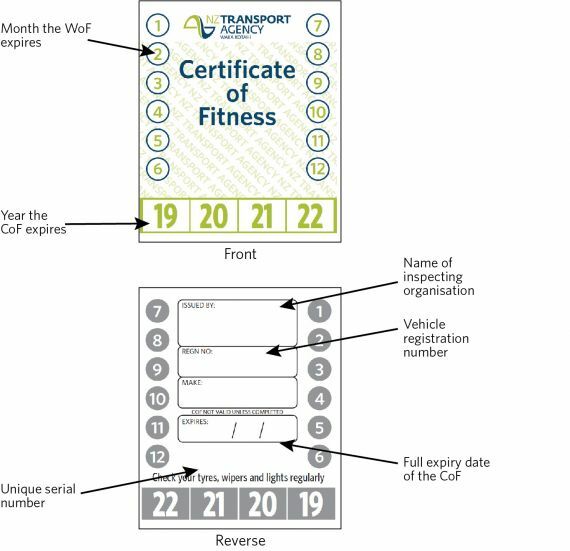 Where it is important to know the exact date to determine the correct expiry date, the vehicle inspector must identify the correct expiry date on Landata or WoF-online BEFORE issuing a WoF label. For a vehicle that has been issued with a pink or green sticker (other than a ‘G2’ green sticker) or that has its CoF or temporary permit revoked: the date the vehicle passes the inspection. ii. six months from the reference date for any subsequent CoF inspections. Important note: As a vehicle may be on a CoF frequency other than six months, the vehicle inspector must identify the correct expiry date BEFORE issuing a CoF label. The expiry date is 28 days after the date of issue of the permit. c) if the WoF, CoF or temporary permit has been revoked by a person authorised by the NZTA. ii. using a hole punch of at least 6mm diameter, punch out the appropriate numbers representing the month and year of the WoF expiry date. iv. full expiry date of the WoF. 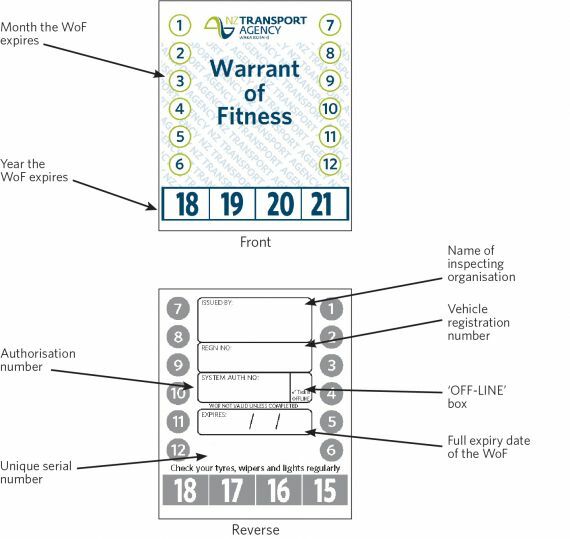 Each WoF label has a unique serial number printed on three places of the reverse side. The two small serial number stickers on the left are for cross referencing of the inspection documentation. The vehicle inspector must remove both serial number stickers and attach one to the file copy of the checksheet and the other to the customer’s copy of the checksheet. c) for any other vehicle, in a position where it can readily be seen. Not more than one WoF label may be displayed at one time. When issuing a new WoF label, the vehicle inspector or a delegated employee of the inspecting organisation must remove the existing label. -punch out the appropriate numbers representing the month and year of the CoF expiry date if using the CoF label in Figure 3-8-2.
iv. name of the inspecting organisation. iv. signature of the vehicle inspector. Each CoF label has a unique serial number which must be recorded on both copies of the checksheet. Not more than one CoF label may be displayed at one time. When issuing a new CoF label, the vehicle inspector must remove the existing label. 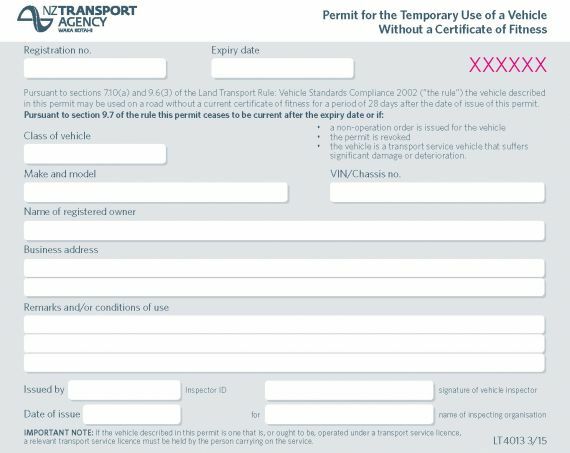 This permit may be issued by an inspecting organisation in the case of a vehicle that does not comply with all applicable requirements, but is safe to be operated subject to specified conditions. The completed permit must be carried in the vehicle. 11. signature of the vehicle inspector. These details must be clearly legible on both copies of the permit. Each permit has a unique serial number which must be recorded on both copies of the checksheet.